The one nave barrel vaulted plan common of Goreme's churches was the most convenient architectural style for the religious communities and those living in seclusion in the area. These buildings were also seen as suitable areas for graves. The transversal rectangular plan originated in Mesopotamia, and it is likely that these buildings were constructed for groups of foreigners settling in the area. 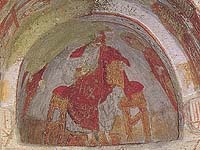 In Goreme, the only church built with two naves is the church of St. Eustathios, however, the churches in Soganli and Ihlara quite often feature two naves. Building to the Basilica plan with three naves is also rare in Goreme, this being a preferred technique for the Bishopric churches such as Durmus Kadir. These churches were big and the arcthitecture very rnate, and for this reason this style was not popular in rocky areas. 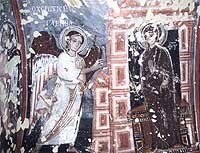 Two types of painting technique were used in the churches. The first is without an undercoat of plaster. Painting was applied directly the bare rock using the roots of vegetables for color. 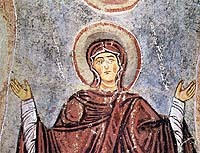 This type of painting can be seen more in the early Byzantine churches and chapels. One can find decorations such as the Maltese Cross and geometrical and floral designs. 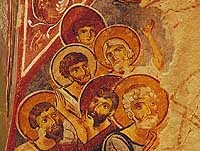 In the later periods, the original paintings were covered with plaster and repainted with scenes from the bible. The best examples for this type of painting are the Buckle Church, Chapel of St. Basil, Apple Church and the Chapel of St. Barbara located in the Goreme Open Air Museum. Also the Fish Church in Zelve and Firkatan Church in Ortahisar. The second technique was to paint onto an undercoat of plaster. Painting was either on the wet plaster, the fresco technique or dried plaster. There is only one example of this technique, which is the Tatlarin Church. In order to give the painting a brighter surface, af ter the painting was completed a kind of glue obtained from plants was applied. The themes on the walls are generally taken from the life of Jesus, the Bible and the Torah. 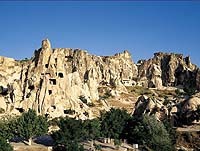 It is also possible to see saints from the christian world and the important people of Cappadocia. We usually see the imortal souls represented in the dome, mortals on the walls and in the main apse, the Deesis.